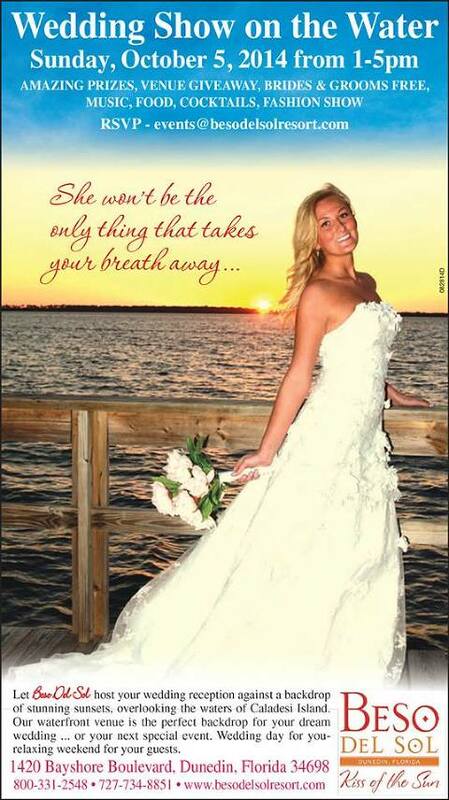 This Sunday, October 5, 2014 from 1-5 p.m., join over 20 St. Pete and Clearwater wedding vendors at the Beso Del Sol Resort bridal show in Dunedin, Fl. Brides and grooms will be treated to a free food and cake tasting, cocktails, live entertainment, a bridal fashion show and door prizes, including the chance to win a free wedding at Beso Del Sol Resort. RSVP for your chance to win! There is no cost for brides and grooms and guests are only $5. Beso Del Sol Resort overlooks the waters of Caladesi Island and seats up to 100 guests for your waterfront Tampa Bay wedding. For more Tampa/St. Pete/Clearwater bridal show tips, read this great advice article: Maximizing Your Tampa Bridal Show Experience. Sunday, October 5, 2014 from 1-5 p.m.